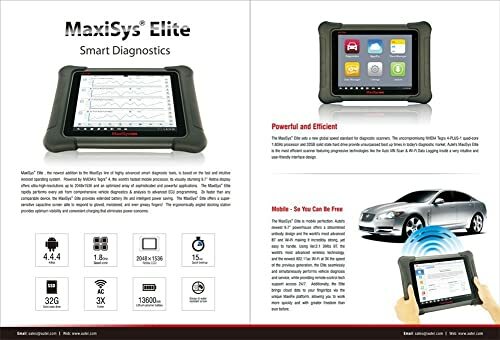 The Autel Maxisys Elite diagnostic tool was delivered in a neatly organized carrying case. 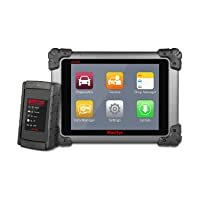 Besides the scanner itself, the case contains the main OBD2 cable and adapters for various vehicles, including GM/Daewoo-12, Fiat-3, BMW-20, Audi-2+2, Honda-3 and Benz-38. Also included is a USB cable and a mini USB cable. There’s a docking station and several other accessories like light fuse, clipper cable, AC/DC adapter and cigarette lighter that are generally meant to make your diagnostic work easier. In short, the case contains pretty much everything you need. Impressive as the packaging is, of course it’s not the most important thing in a scanner. 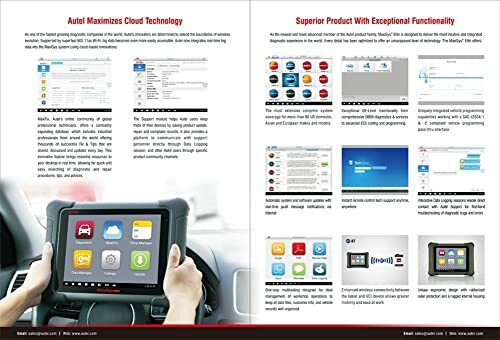 What you need is a diagnostic tool with wide coverage and outstanding functionality. So how does the Autel Maxisys Elite fair in that regard? Below is my review. I’ll start with compatibility so that you know whether it supports your vehicle in the first place. The scanner was able to communicate with every single vehicle I tried it on. While it’s primarily an OBD2 tool, it does work on some OBD1 vehicles. Actually, the carrying case contains adapters for those particular OBD1 models. 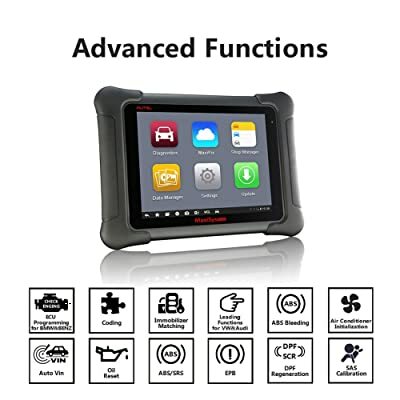 This diagnostic scanner offers a variety of advanced functions. So far there’s ALMOST no vehicle that I can’t diagnose using this scanner. For trials sake I tried it on as many vehicles as possible. And it also supports all OBD2 protocols for local and foreign vehicles. On the other hand, this includes heavy, medium and light-duty trucks, diesel engines, SUVs, cars and hybrids. As a professional, I love that it has wide coverage. With it, there’s no customer that I won’t be able to serve to satisfaction. Autel Maxisys Elite supports all OBD2 protocols for local and foreign vehicles. In some few instances, the scanner won’t identify a vehicle automatically. A case in point is when I tried it on a 1998 Dakota. Moreover, usually, it’s possible to bypass that step and simply enter the vehicle details manually. In this case, it still couldn’t communicate with the vehicle’s airbag system. That’s one of the rare instances where the scanner’s compatibility with a vehicle was disappointing. Preparing the Autel Maxisys Elite for use is as simple as it can possibly get. First, it’s a plug-and-play device; no assembly or anything like that. However, it needs registering and updating. It’s a simple process that’s outlined in the user guide. It involves registering the tool through Autel’s website. You will be prompted to enter its serial number. After that it will update automatically, just make sure the Wi-Fi is on. The setup procedure is simple and straightforward. It only took a few minutes to register the device and upgrade its software. You won’t be asked to pay anything for the first update. On the downside, the free software updates last for one year only. After that, you’ll need to pay $695 per year for subsequent updates. That’s rather high considering the scanner’s price is on the higher side, to begin with. The Autel Maxisys Elite runs on Android operating system. In addition to diagnostics, the OS supports several other functions. 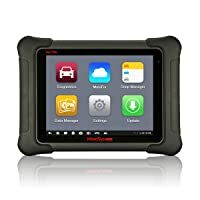 For instance, the scanner features a stunning retina display screen, built-in camera, Bluetooth, Wi-Fi and a host of other handy apps like calculator and browser. Any mobile device that runs on Android is bound to be an amazing performer. The Maxisys Elite is no different. I was super impressed by its speed. The scanner takes just about 8 seconds to boot up. And it can run several apps at the same time; that’s Android’s multitasking ability. So as a technician or DIY enthusiast you can view diagnostic data and browse the internet at the same time. I’ve mentioned this already but it’s worth mentioning again. Updating the scanner’s software will cost you a whopping $695 per year. That is quite high by any standards, especially since the scanner is already a high-end product. It would have been nice of Autel to lower the price. In the Autel Maxisys Elite kit, you will find a main OBD2 cable for connecting to a vehicle’s OBD2 port. That’s standard for virtually all diagnostic scanners. But what is not standard is Wi-Fi and Bluetooth capabilities. This device supports both. Meaning it can communicate with a vehicle wirelessly and also access the internet. 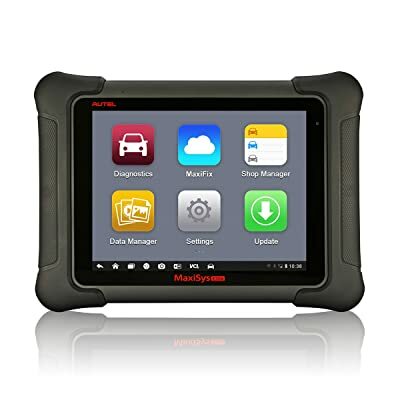 Autel Maxisys Elite is a diagnostic tool that is smart, mobile, powerful and efficient. The Bluetooth module creates a very strong connection with a vehicle’s VCM. I never experienced a single issue with that. As for the Wi-Fi, it makes the diagnostic process a whole lot easier. In case you feel stuck you can simply go online and find a solution to your problem. There are many forums, including Autel’s MaxiFix, where experts and DIYers provide professional help. Also, Wi-Fi makes it easy to update the scanner. I have connected my Maxisys Elite to the shop’s Wi-Fi and it lets me know whenever there are new updates. It is almost satisfactory. The key phrase is ‘almost satisfactory’. Only one complaint; the scanner’s internet speed is not the most impressive. If you are used to high-speed Wi-Fi this might frustrate you a bit. This is what counts the most in a diagnostic scanner. And simply put, there’s barely anything that the Maxisys Elite can’t do. Whether you want to read and clear codes or perform advanced diagnostics, it does all that. I was able to program keys perfectly. It did pull pin numbers from a VW’s instrument cluster when I was coding new keys. First, all the functions work perfectly, you couldn’t ask for better performance. And, the scanner supports bi-directional control while providing live data. In addition to this, you can see exactly how a change in one thing affects a vehicle’s onboard systems. A huge plus is that it shows multiple data PIDs for easy analysis. And if you come across anything unfamiliar you can simply go online and check it using the MaxiFix platform. Or you can ask experts to help you out in the many diagnostic forums available online. The scanner’s user manual claims that it also supports online ECU programming on BMWs and Benzes. I didn’t really get to that point but if it truly does then that’s a handy feature for any technician. The MaxiFix platform is a good idea but a built-in troubleshooter would have been a better idea. If you are a professional you might not have the time to go online, post a question and then wait for some random person to help you out. Also, It would have been better if Autel had included a troubleshooter that can offer instant diagnostic solutions. Autel Maxisys Elite is a superior product with exceptional functionality. Bottom Line It is suitable for professional technicians It is ideal for professional techs and mechanics. 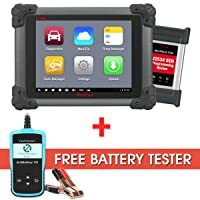 It is highly recommended for professional techs and car owners. In short, this scanner is a perfect pick for professional technicians. It makes working fun and easier. I like that it comes with a docking station because you can leave it in your toolbox or shop desk all day. The Autel Maxisys Elite is undoubtedly an elite scanner designed for professional use. 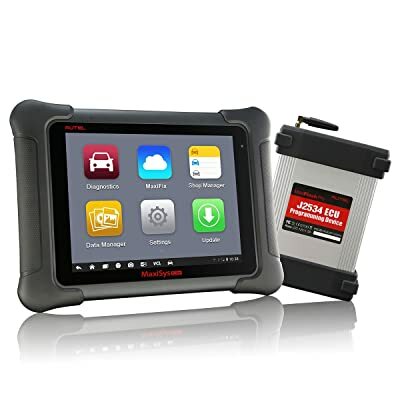 What is more, with an impressive functionality, wide vehicle coverage and sleek design, this device can easily pass as the best full function OBD2 diagnostic tool.